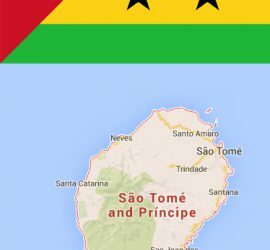 Sao Tome and Principe, Portuguese “São Tomé e Príncipe” is an island state in the Gulf of Guinea, about 200 km off the coast of Africa west of Equatorial Guinea and Gabon. 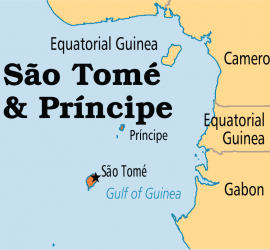 The island of São Tomé is named after Saint Thomas; Príncipe is the “island of the prince” (or: the “prince”). São Tomé and Príncipe is the second smallest state in Africa after the Seychelles. The two islands are located between the islands Bioko and Annobón, which are part of Equatorial Guinea. point is 2024 meters. São Tomé is the capital of the same name. The northern, smaller island of Príncipe is about 16 kilometers long and six kilometers wide; its highest elevation measures 927 meters. Both islands are part of a chain of mountains along the Cameroon route, which continues on the African continent in Cameroon. In São Tomé and Príncipe the volcanoes are no longer active. The southern tip of São Tomé is just two kilometers north of the equator, the island of Rólas is crossed directly by the equator. In São Tomé and Príncipe, the mountainous topography affects hot and humid tropical climate with rain and dry weather. The temperature has hardly any seasonal fluctuations; the average annual temperature is 28 ° C on the coast, 20 ° C in the country. The annual rainfall ranges from 1000 mm in the northern lowland to 5000 mm in the southwestern mountain slopes. The rainy season lasts from October to May. The population of the state consists of mestizos, angolares, forros, servicais, tongas and europeans (especially portuguese). The annual population growth was estimated to be 2.4% in 2010. In addition to the Portuguese language, which also serves as a lingua franca, the island still has a variety of Creole languages based on the Portuguese and Western Bantu languages: Saotomensic (70,000), Principensic (1,500) and Angolar (5,000). About 80% of the population is Catholics, while another 10% are Protestants, New Apostolic and Animists. Infant and child mortality rates were 3.7% in 2009, life expectancy was 66 years. In 2007 the female life expectancy was 67.3 years and the male was 63.5 years. Healthy life expectancy is 54 years. The country is affected by malaria. In 2006, government expenditures amounted to 120 US dollars (purchasing power parity) per capita. Adult illiteracy is minor. Their share is 12.1% (2009). Half of the country’s teachers are under-qualified. São Tomé and Príncipe has colleges. The explorer of the islands is the Portuguese sailor João de Santarém. This was in the service of the merchant Fernão Gomes, who had acquired the right of the Portuguese King Alfonso V to explore 100 leguas of the African coast on behalf of the Portuguese Crown at his own expense. On 21 December 1471 he discovered São Tomé and on 17 January 1472 Santo António (or also Antão); the latter was renamed to Príncipe in 1502. In 1485 the first Portuguese branch was founded. On the one hand, the islands served as the hub for the slavery trade between Africa, Portugal, Brazil and the Caribbean islands. On the other hand, Portuguese Jews and prisoners who had been expelled from the Inquisition settled here. In 1572, São Tomé was subordinated to the Portuguese crown, and in the following year Príncipe was placed directly under the Portuguese crown. Subsequently, a planting economy with changing monocultures developed, first in the 16th to 18th century sugar cane, then in the first half of the 19th century coffee and finally around 1850 cocoa; At the beginning of the twentieth century, the islands were even the world’s largest cocoa producer. On August 13, 1913, Germany and England signed a treaty whereby the two islands were to be incorporated into the German colonial empire as a compensation for Portugal. By the loss of the German colonies in the Treaty of Versailles in 1919 the German-English treaty of 1913 also fell. On May 29, 1919, the solar eclipse expedition under the leadership of Arthur Stanley Eddington on the volcanic island of Príncipe experimentally confirmed the correctness of the general relativity theory. The end of the colonial era began with the establishment of various liberation movements outside the country. In Ghana, the Comité de Libertaçao de São Tomé e Príncipe (CLSTP) was established in 1960 as the forerunner of the Movimento de Libertação de São Tomé e Príncipe (MLSTP) (starting in 1972). In 1974, after the Nelkenrevolution in Portugal, the MLSTP was recognized as a legitimate representative, which finally led to the release into the independence on 12 July 1975. 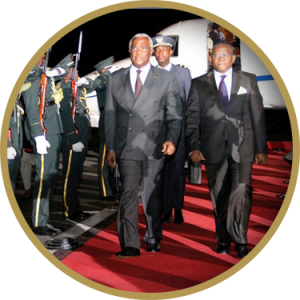 The MLSTP dominated the country as a unitary party the first 15 years after the end of the colonial period. In 1991 Miguel Trovoada was elected president of the country. In 1995 there was a coup; the following governments proved to be relatively unstable. On 5 January 1999, Guilherme Posser da Costa was appointed Minister-President. However, corruption scandals, in which fake treasures worth US $ 500 million played the leading role, brought the government quickly into trouble. In March 1999, the Finance Minister and the President of the Central Bank resigned. In August 2001, Fradique de Menezes was elected President. On July 16, 2003, there was a military coup under the leadership of Major Fernando Pereira. At that time President Fradique de Menezes was on a state visit to Nigeria, so only the Prime Minister and some other ministers were arrested by the putschists. On the very next day, the Putschists announced a transitional government and a new election. The reason for the coup was the unsafe political situation on the island, which had arisen by oil exploration some years before and the resulting disputes. After eight days, the military coup was ended without pressure by the international community. 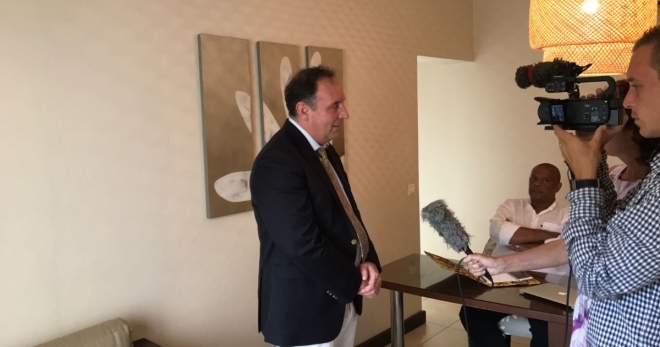 In a “Memorandum of Understanding” a stronger participation of the population in important government decisions was granted. There was a transformation of the government under the leadership of the Prime Minister, but the replacement of seven ministers. In September 2004, there was another government change following a bribery scandal involving Prime Minister Maria das Neves and other ministers. President de Menezes was re-elected in July 2006. The presidential elections of 2011 won Manuel Pinto da Costa in the selection of 7 August 2011. He took over his new position on 3 September 2011. Pinto da Costa previously served as the President of the Republic. every four years by proportional representation. The president is elected directly every five years and may be re-elected once. Anyone aged 18 or over is entitled to vote. São Tomé and Príncipe is one of the few countries that recognize not the People’s Republic of China but the Republic of China on Taiwan under international law. 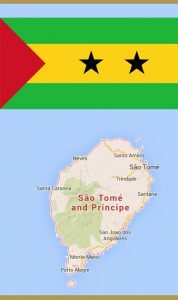 São Tomé and Príncipe is divided into two provinces, which in turn are divided into seven districts. The island of São Tomé and the surrounding islands form the province of the same name with the city of São Tomé as a provincial capital. This province is divided into six districts. In 2000, 15.3% of households received their income from agriculture, 36.5% from industry, trade and services, and 11.5% from the public sector. The still economically insignificant island state exports almost only cocoa (share in 2009: 95%). This economic austerity direction dates back to the colonial era. Natural resources are also important to other agricultural products, the fisheries and petroleum reserves, which are not yet to be promoted. 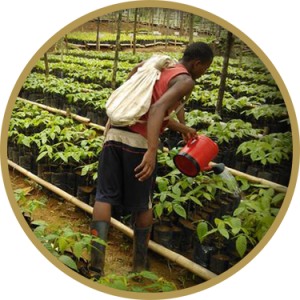 Agriculture accounted for 14% of the gross domestic product (besides cocoa is the production of coconuts, copra, cinnamon, pepper, coffee, bananas, beans, vanilla and poultry). The total area is 484 square kilometers. The share of industry in gross domestic product amounted to 15% in 2009. Produced or processed, a. Shirts, soap, beer, fish and crabs as well as palm oil. On services, in particular tourism, accounted for 71% of gross domestic product in 2009. In recent years, São Tomé and Príncipe has increasingly supported private initiatives to develop tourism. In 2009, imports worth EUR 14.0 million were worth EUR 93 million. These include imports from Portugal (43%), France (16%) and the UK (14%), food and livestock, fuels and capital goods. The main export countries are Portugal, the Netherlands, Spain, Germany and the People’s Republic of China. In 2009, São Tomé and Príncipe had no indebtedness against the rest of the world (see below: oil), after the foreign debt had amounted to 318 million USD in 2002. 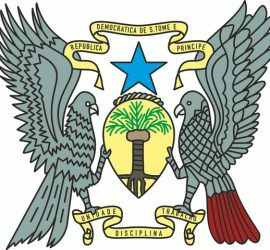 São Tomé and Príncipes gross domestic product is one of the smallest in the world and in 2009 was about 191 million US dollars; the gross domestic product of 2009 per inhabitant was around 1700 US dollars. The inflation rate in 2009 was 17%. Through the sale of offshore oil drilling concessions in the Joint Development Zone (JDZ) jointly managed by Nigeria, São Tomé and Príncipe achieve 40% of the income, while Nigeria receives 60%. In the 1990s, geologists suspected about eleven billion barrels of oil under and around the islands. 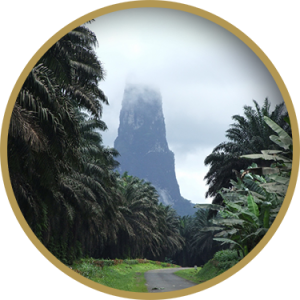 For journalists and scientists – according to Bartholomäus Grill in Die Zeit in 2003 – the island state is considered a “black Brunei” or “second Kuwait” and has four billion barrels of oil reserves. According to the German Institute of Global and Area Studies, oil of up to one billion barrels was detected in the deep sea of ​​São Tomé and Príncipes until 2006. In 2003, Chevron offered an advance of 49.2 million dollars to investigate the exploration blocks. The oil company Total also registered rights for the first of nine exploration blocks. Nevertheless, no drillings were carried out, as the Group was unsuccessful in its success. For the future, offshore oil and gas production is expected. The geostrategic situation in West Africa, which is regarded as the future of the drilling sites, U. led to the first oil-political race between the People’s Republic of China and the USA. 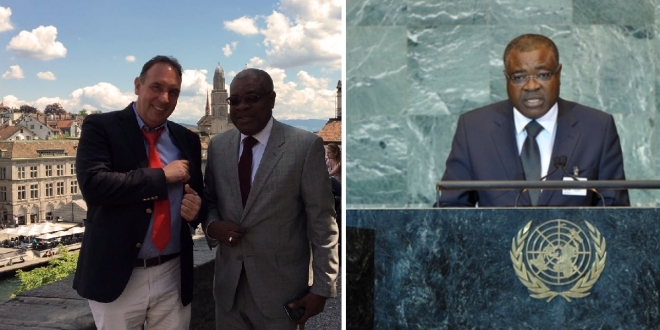 Both are currently intensifying diplomatic efforts to explore exploration and drilling rights for nearby companies. In this context, the US appears to be interested in building a maritime support point at São Tomé. 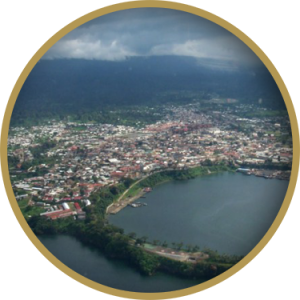 São Tomé and Príncipe is not a member of the World Trade Organization (WTO). A large container port is currently being planned in the north of the country. Corresponding contracts with investors are currently being signed. In 2009, the state budget included $ 57.5 million, which was offset by revenues of $ 48.8 million. This results in a budget deficit of 4.5% of GDP.